I feel like I've been in a car crash. My back is killing me, abdomen bruised and I can barely make a fist. My elbows and wrists ache, arms are jelly and face sun burned. I'm not looking for sympathy however as all the aches and pains were brought on by choice and don't worry I wasn't in a car crash. Another early weekend day trip departure and again we were going for cats on the Red River. First to the launch after a 2 hour drive and we headed south towards Lockport with the anticipation of hammering trophy catfish. Bald and golden eagles soared above the tree tops on the rivers edge while pelicans rode the current hunting for goldeye or whatever else they could find. The water was high, in fact it was higher than our last visit a few weeks back by at least three or four feet. We weren't expecting that but then again with all the rain the watershed has been getting this year we shouldn't have been surprised. Once we made it to the locks it was clear why the current was so strong as they had opened 2.5 curtains allowing for an extreme amount of water to be flowing through. It was clear we were in for a challenge. We anchored up in one of the only spots we could and tossed our baits out. 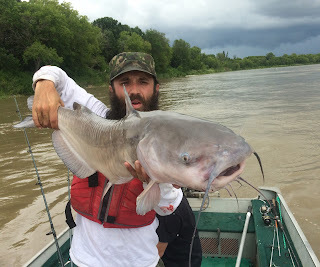 None of us had targeted cats when the water was flowing this strong and we knew we would be fighting the current as much if not more so than the catfish itself. Fish breached all around us as far as the eye could see and a vast majority of them were catfish but we saw some common carp, quillback suckers and big mouth buffalo breach the murky surface as well. With three of us on the boat we each started off with a different bait to see if one might out perform the other and after two missed bites and a fresh chunk of cut bait on my octopus hook, I was able to hook into our first kitty of the day. The bite was savage, nothing subtle about it, I felt the weight and then line went peeling off my spool as the catfish realized it was hooked and headed for stronger current pushing downstream. It felt surprisingly heavy but in current like this you never really know how big it might be. Each time I would gain some line back it would dig and thrash its head in protest and quite easily turn around and head back downstream. After about 5 minutes I was starting to think I had a real bruiser on the end of my line as we still hadn't seen any sign of it and there was still plenty of line out. 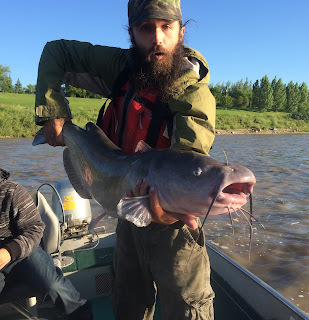 The battle raged on for another 10 minutes before we finally had our first attempt at netting it and that's when it was clear just how big this catfish really was. "That's over 36 for sure," Jay exclaimed as the catfish began a death roll on the surface like a crocodile unwilling to let go of its prey. All I could do was keep the pressure on and continue to try and get the fish boat side. The Look on my face says it all. It dug down deep again and again, each time I would heave the rod up I would take in a little bit of line and after a few tense moments it was back near the surface again only to peel off down below. The fight was turning in to the longest I had ever had and was wondering if the catfish would ever tire enough to net when we could see the swivel on my line and Jay dipped the net in and under where he perceived the fish to be and up it came and into the boat. It was BIG and looked like a possible personal best and when we put it on the bump board it topped out just under 39 inches. I was in a state of shock and mild exhaustion and after some pictures our first fish of the day was released to recuperate after a respectable battle. I slouched over in my chair to take a breather and re tie my rig and it wasn't long before Jay hooked into a 31 incher and then a 33 before I could bait up and cast out. 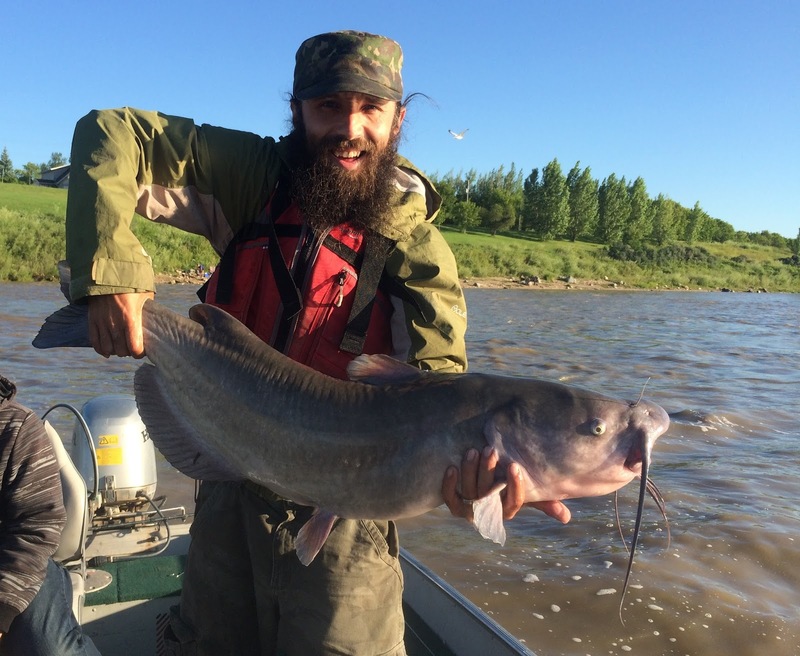 The next two fish would go to Frodo, the first at 34 inches and the second at 32.5, oddly enough we were more excited about the smaller one as it was his first tagged catfish. In my opinion catching a tagged fish is similar to a waterfowl hunter getting a banded bird. The info was recorded off of the tag and will be called in soon. We were off to a good start but after a snagged rig forced us to anchor up and retrieve it, we weren't able to quite get back on our honey hole. 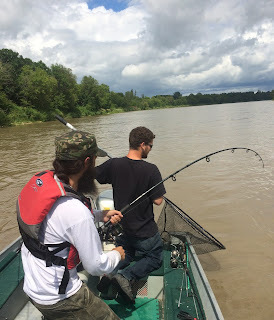 We did find another sweet spot though and continued to hook up with relative consistency, however we did lose a few fish as well and were attributing that in part to the strong current and such eventually decided to try a few spots down from the locks. One bait wasn't really outshining the other but we sure were going through it. Many bites were missed and again a few more fish lost (embarrassing) and when we did hook up it was one heck of a fight as a few times we had to anchor up to chase the fish. It wasn't an easy day on the river, the current was stronger than we had anticipated and getting on our spots was sometimes challenging. This entailed me (the anchor boy) dropping and pulling up the anchor well over 20 times, some of which were quite strenuous and Jay (the captain) expertly controlling the boat through all stages of our day. At one of our spots we ended up with a double header on and boy was that exciting, the fight to keep our respective fish on our sides of the boat was a blast with hoots and hollers heard a mile away during and after the trophies were landed I'm sure. 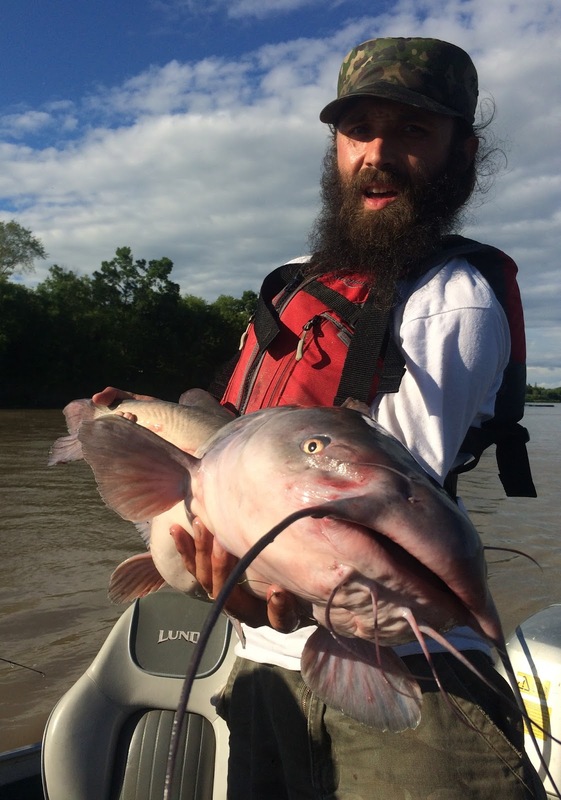 We ended the day with roughly 11 hours on the water, while managing to get 25 catfish to the boat and missing more bites than we would care to admit. Sadly between us we lost at least 10 fish during the battle as well with one or two looking comparable to my 38.75 inch beast. As much as we would have liked to keep fishing we had a long drive home and were content with how the day played out. A personal best catfish, a tagged catfish but the 40 plus inch channel catfish still eludes us. Back at the launch it was good to feel solid ground beneath my sea legs after all the waves and bouncing around on the turbulent Red River for a day.